Groove Tunes Studios produces and records singer/songwriters, bands, small ensembles, solo artists, musicians, vocalists, and more. Whether you need to record a demo, a single track, or an entire album, Groove Tunes is the recording studio where your project will receive complete and personal attention from conception through final completion. You will be working with the same competent, professional producer/engineer that you agreed to work with from the start all the way to the completion of your job. And if you've dreamt at having some of the best session musicians in the country playing killer backup tracks on your album, you will find Groove Tunes to be the perfect studio to help you realize that dream. Featuring the industry standard Pro Tools HD v. 9.0.1 Accel 3 recording system and Waves Diamond v. 6.0 effects bundle, Groove Tunes can record up to 80 high definition audio tracks at DVD audio quality, or an unbelievable 192 tracks at Red Book CD audio quality. An array of extremely high quality new and vintage microphones and pre-amps all connected using Mogami and Monster cables in acoustically-tuned rooms ensures optimal sound quality throughout the entire signal path. 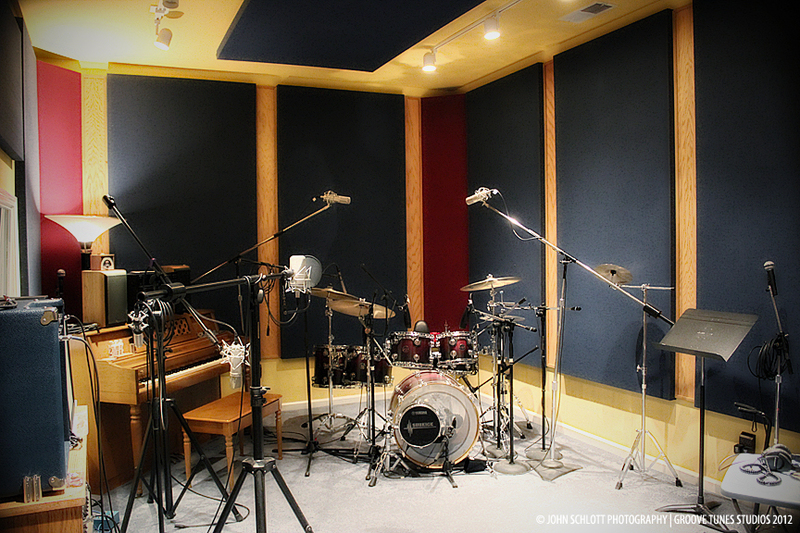 The studio’s “Live Room” is equipped with a full drum kit, piano, synthesizers, and guitar amplifiers for customer use. When needing to kick back, the adjacent spacious indoor Lounge features a 106” high definition video display and audiophile quality surround sound audio playback. Also provided are an outdoor screened in patio lounge, a kitchenette, and clean restrooms. Whether you provide your own producer or rely on our staff’s 30-plus years of musical creation experience, our mission is to make sure you enjoy your recording sessions and that you are completely satisfied with the final results. If you need help with creation or accompaniment we can offer talented writers and musicians to assist you. Whatever the need we will work within your plans and budget to come up with a solution to best suit you. Groove Tunes Studios is owned and operated by Eric Tunison. A musician, engineer, arranger, producer, and lifelong music enthusiast, Eric has been recording music on both coasts for over 30 years. A former engineering project manager with numerous multi-million dollar projects to his credit, Eric combines his musical know-how with a professional, easy-going demeanor, keeping stress levels low while helping musicians create their masterpieces. Eric will be with you from beginning to end during your project to ensure that every aspect is done to perfection and according to your needs. Other talented producers, writers, or engineers can be brought in to assist on certain projects. "Making great sounding music is what we do best. Our mission is to help you create the best music you’ve ever dreamt of making. Please feel free to contact us anytime to discuss your next recording project. We look forward to working with you!"